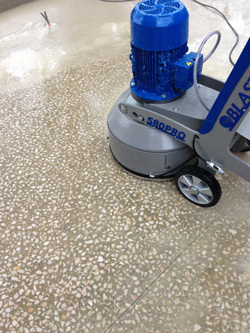 In close partnership with concrete manufacturers, Blastrac has developed a full range of equipment and tools specifically for exposing the aggregates on floors. These techniques comply with the most common requests from architects, designers and end users of decorative floors, who are constantly looking for innovations, new aesthetics, and user-friendly floorings. Decorative floors are a new, fast developing market trend. Concrete is no longer considered as sole support, it becomes part of the decoration itself. Bush-hammered concrete is a process which enables you to achieve a similar effect to natural cut stone, with a concrete surface as a basis. The concrete is poured and mechanically abraded in order to give an authentic effect to outdoor areas. The bush-hammered concrete is the ideal solution for people who want to have a natural effect, less smooth than the polished concrete, less rough than the brushed or blasted concrete and less decorative than the stamped concrete. This type of retexturing process is created by impacting surface aggregate with numerous small hardened steel hammers (often referred to as “bush-hammering”) to roughen the aggregate surface. The Blastrac grinders can be equipped with different sizes of bush-hammering cutter plates in order to satisfy every need of our customers. 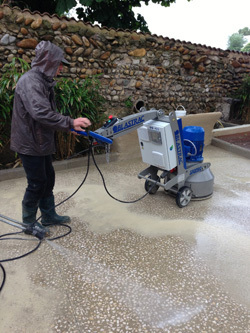 One of our customers recently carried out two jobs of bush-hammered concrete in France. After he poured the concrete in, he could begin the bush-hammered job the following day with the Blastrac grinders. The two jobs were very successful, giving a very pleasing, finish. 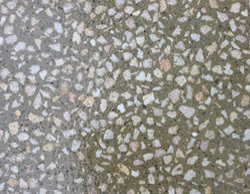 Once the concrete was bush-hammered, it created new, “sharp” angular edges on the surface of the aggregate. It’s an easy and cost-effective way to enhance basic concrete surfaces in order to give them unique aesthetics properties, and decorative too.